The U.N. human rights office accuses police in the Democratic Republic of Congo of violently breaking up peaceful protests ahead of the country's long-awaited election campaign. 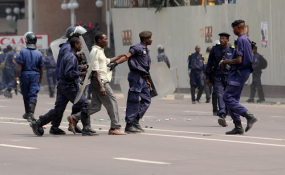 The rights office says it is deeply concerned about the violent tactics used by Congolese police to suppress peaceful protests by civil society organizations and opposition political parties. Agency spokeswoman Ravina Shamdasani says it is happening despite a pledge by authorities to lift a ban on demonstrations, which has been in place since 2017. "Ahead of the crucial national elections on the 23rd of December this year, we urge the Congolese authorities to uphold the rights to freedom of expression and peaceful assembly. Any allegations of excessive use of force by the police and security forces must be investigated, with a view to holding … those responsible to account," she said. Shamdasani says one political activist has been killed in the southeast of the country and more than 140 demonstrators have been arrested since August, many of them arbitrarily. She says people are being detained on charges such as rebellion, criminal association, vandalism, arson and insulting a police agent. She told VOA some people have been released from prison and that is welcomed. "However, the mere fact of their detention for expressing their views, for attempting to hold a protest is very worrying, particularly ahead of an election. It does send a message to civil society activists and opposition political parties that dissent will not be tolerated," she said. Shamdasani says her office will not be monitoring the conduct of the election itself. But, she says it will be monitoring the human rights environment around the election. She says human rights monitors will be observing whether people will be able to freely assemble and express themselves. She says they will also keep track of how people put in detention are being treated.